A funeral mass is scheduled for 9:30 a.m. Thursday, Sept. 8, at Our Lady of Grace Catholic Church for Patricia “Chata” Montoya of Lake Arthur. Montoya, 78, joined the Lord Sunday, Sept. 4, 2016, in Artesia. She left peacefully, surrounded by family. Interment will follow the services at Woodbine Cemetery. Pallbearers will be Gabriel Montoya, Chris McNeil, Tootie McNeil, Jeremy Montoya, Thomas Baeza, Danny Montoya, Gonzalo Montoya III and Richard McNeil. Honorary pallbearers are her children, grandchildren and great-grandchildren. Visitation will be held until 4 p.m. today at Terpening & Son Mortuary. A rosary will be recited at 6:30 p.m. today at Our Lady of Grace. Patricia was born March 17, 1938, in Mulato, Mexico, to Juana and German Valenzuela. On Jan. 17, 1956, she married Gonzalo Montoya Sr. in Presidio, Texas. They shared 60 years of marriage. Patricia was a homemaker who loved God passionately. Her faith in Jesus Christ and his saints never ceased. She prayed for each of her children and grandchildren daily. Survivors include her husband, Gonzalo Montoya Sr.; nine children, Mary Pasillas of Roswell, Juanita Aguilar of Cottonwood, Rosa McNeil and husband Richard of Silver City, Lupe Baeza, Gonzalo Montoya Jr. and wife Diana, Abel Montoya, Javier Montoya, and Danny Montoya, all of Lake Arthur, and Gabriel Montoya of Artesia; brothers Santos Valenzuela of Artesia and Manuel Valenzuela of Mulato, Mexico; sister Lala Armendariz of Arlington, Texas; 22 grandchildren; 49 great-grandchildren; and beloved friend Ana Denton. 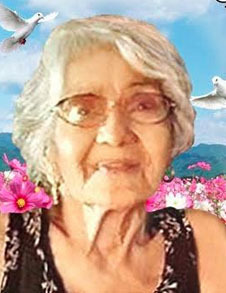 She was preceded in death by her parents, Juana and German Valenzuela; daughters Natalia and Gloria; brothers Felix, Felipe and Catarino Valenzuela; and nephew Eric Segura.